1. How difficult is it to cycle 60+ km a day? One of our key considerations when choosing a route is accessibility. We aim to balance the ‘challenge’ aspect with the objective of keeping the cycle open to all abilities. Therefore, you certainly don’t have to be a professional cyclist to participate in Cycling4Gaza. Having said that, as a sporting challenge, it will require a big commitment to training, as it is certainly no cycle in the park! Each cyclist should condition their body to be in the saddle for extended periods of time. This sounds daunting, but upon registration, a huge support network will open up to each cyclist. C4G will provide training materials containing information, calendars and tips on training, and the committee is always available to help. Some group training sessions in cities with adequate number of registrees are often arranged: typically in London, Dubai, and Riyadh (spinning classes and outdoor cycling). We will work on organising group training sessions in other cities if feasible. Finally, it goes without saying that the strong sense of purpose and camaraderie with the other 50 cyclists will give that extra push when you most need it! This years cycle will cover a lot of terrain and sufficient training is required to ensure you will be comfortable throughout the cycle. 2. How many hours do we cycle per day? We aim to limit your time on the saddle to 6-8 full hours a day, excluding water and meal breaks. This could mean early starts so as to ensure we arrive at our destination before dark each evening. 3. Is it safe to cycle in Europe? Yes. We work very carefully to select a tour operator whose priorities are in line with ours, and safety is utmost among them. This route has been covered previously by cyclists and has been chosen based on extensive consultation with our Tour Operator in Europe. The Operator has also personally covered the route by car and on bicycle to ensure we are cycling the correct distance and terrain as safely as possible. 4. Is there a typical cyclist age group? Cycling4Gaza always boasts an impressive range of cyclists each year, with our youngest rider being 16 and our oldest over 60. This makes for an interesting group dynamic and a wonderful experience across the board, from cycling to socialising. It should be noted that any participant who is under 18 will require an adult (18+) guardian to accompany them. 5. How much does it cost to join the challenge? When is the deadline to register? It costs £1050 to register which includes all the expenses for the 5 days including food, accommodation and transport etc… A non refundable initial payment of £500 should be paid through Cycling4Gaza’s fundraising page and a confirmation of payment should then be sent to info@cycling4gaza.com by the 15th of April 2019 to confirm your place on the cycle once you have filled in the online registration form – NO PAYMENT NO PLACE, the remaining £550 should be paid by the 30th of April 2019. Please note that in addition to the £1050, the minimum fundraising amount is £1500 which goes directly to the PCRF Project, making a total of £2550 to be submitted by the 15th of August 2019. 7. What does my registration fee cover, and what do I need to take care of? 8. What shall I bring with me? – A bike helmet (offered if you rent a bike). You will not be allowed to cycle without a helmet. – Cleats or clip on pedals if you are planning to use them. Standard pedals are provided with the rental bikes. – Two water bottles or a refillable water source such as a Camelback. 9. What if I don’t own a bike? No worries. Indicate that you would like a hire bike in the online Registration Form. We’re happy to arrange that for you! All hire bikes will be delivered at cycling starting point. 10. Does C4G arrange visas? C4G does not personally arrange for cyclists’ visas, but we facilitate the process by providing appropriate documentation required by the relevant authorities. 11. What are the luggage restrictions? Please limit belongings to a carry-on bag. Throughout the challenge, all luggage will be carried in our support van. 12. How does my bike travel back and forth to Europe? You must arrange to appropriately pack your bike and inquire about the sports luggage allowance with your airline. So far, all airlines have been accommodating to cyclists’ needs, and we are happy to provide packing tips. 13. Do C4G arrange our flights? No. Flights logistics are the responsibility of each cyclist. However, we will provide cyclists with recommended flights to ensure that everyone arrives at similar and respectable hours. We will also track your booking and ask for details prior to the cycle. 14. Can you tell me about room-sharing and accommodation? We will be checking in to different 3/4-star hotels on arrival day and at the end of each cycling day. All rooms are twin full-board – we will work on matching cyclists of similar profile together (gender, age, etc…). 15. I love the idea of providing support for Palestine but I’ve never fundraised before. Do you think it will be difficult? Fundraising can seem daunting but with time, it becomes a passion as well as a skill. Every year, the Cycling4Gaza team is comprised of first-timers who have joined because of their passion for the cause and have done great (both on fundraising and cycling fronts). Click here for tips. 16. How can people make donations? Cyclists are required to create an online donation page (click the following link for instructions – Fundraising. We encourage donations online as your donation pages are linked and therefore funds raised can easily be tracked. Of course, cash donations can be accepted, as well as bank transfers and cheques (email us in info@cycling4gaza.com for details). 17. Where do the donations go? Cycling4Gaza operates on a volunteer basis. Therefore, each year, 100% of the funds raised go towards healthcare and educational projects in Gaza. Our charity partner, The Palestinian Children’s Relief Fund, focuses on providing vital healthcare for children in the West Bank and Gaza strip. Following the cycle, the PCRF provides detailed reports on the progress of the projects C4G has contributed to, and we can provide this to cyclists to circulate among their network and their donors. Click here for details on this years project. 18. Who is responsible for the logistics? 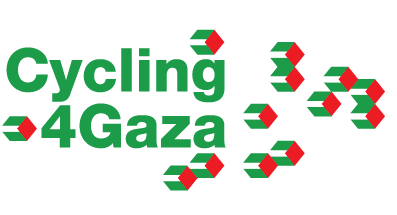 All logistics arrangements from airport pickup up to the end of the cycle are organised by the Cycling4Gaza team in collaboration with the Tour Operator. This includes your full-board hotel accommodation in 3/4-star hotels. 19. What if I do not make the minimum fundraising amount? In the event that you have not made the pre-cycle fundraising deadline, then we encourage the cyclist to continue to raise the funds after the cycle is completed, or to provide additional non-financial contributions. 20. What happens if I cannot make the cycle? Most of the cycle costs are paid as a group lump sum to our tour operator and respective stakeholders (hotels, food providers, bike rentals) prior to the cycle taking place as we are a big group. This means that should you not be able to make the cycle, you will not be able to recoup the amount required to cover your share of the above expenses unless you manage to find a replacement participant who will shoulder the expense burden on your behalf £1050 and who is also able to meet the minimum fundraising amount according to our deadlines or II. We have adequate time to get a wait-listed cyclist registered, on track with our minimum fundraising amounts and with no foreseeable hurdles (visa processing time, etc).